The Council for Economic Opportunities in Greater Cleveland invests in people, nurtures their success and transforms lives. The Council is a nonprofit organization and the designated Community Action Agency for Cuyahoga County that operates programs and services dedicated to transforming lives. We are the largest high-quality Head Start early education provider in the State. The Council delivers education, personal and professional development programs and support services to residents of Greater Cleveland. To learn more about the latest with the Council, check out our current e-newsletter here. To receive the e-newsletter each month, sign up at the bottom of this page. The Council has served Greater Cleveland for 54 years. The organization formed in 1964 in response to President Lyndon B. Johnson’s War on Poverty which established the nation’s Head Start early childhood education program and numerous initiatives designed to empower individuals to move beyond the situation they were born into or found themselves unintentionally a part. 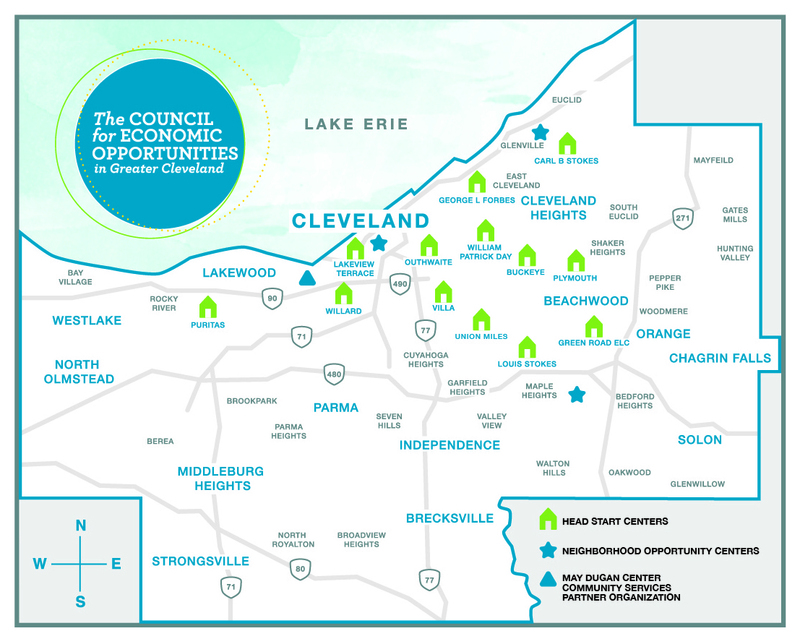 In the past half a century, the Council has helped hundreds of thousands of Greater Cleveland residents better understand the connection: education + growth = prosperity and well-being. The first Head Start classrooms opened in the Fall of 1965: one on Cleveland’s East side and one on the West side. The Council’s first Neighborhood Opportunity Centers opened in 1966. Today there are locations throughout Cuyahoga County for one-on-one assessments, goal-planning sessions, pep talks, milestone marking, classes, workshops, and job placement. Individuals and families have places where they can articulate dreams—and learn how to make them a reality. For a snapshot history of the Council, click here. Our 17 locations include 13 Head Start early childhood learning and family involvement centers, three neighborhood opportunity centers (one each on the East, West, and South sides), and one centrally located job training and placement office in downtown Cleveland. All locations are served by the Rapid Transit Authority. For our 2017-18 Report to the Community, click here.